Spooky Week in the Studio! 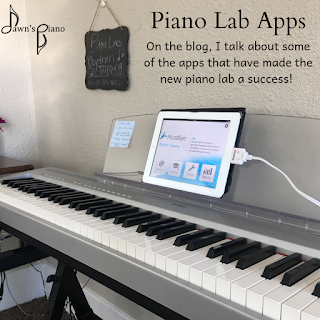 One of the things I was very excited about in setting up my new home studio was establishing a Piano Lab area where students can practice self-led study, explore and use technology to increase their sight reading, ear training & reinforce musical concepts. And it's been a great success thus far. I am seeing beginning students become confident in what they're learning, and growing in their ability to self-correct, try again and their mastery of musical terms & concepts. And one of the ways I keep students on their toes is to choose an "App of the Week" on a little blackboard that hangs above the piano lab. So my app reviews today are about the Musition & Auralia apps that I've been rotating through the App of the Week position. These could easily be incorporated into home practice, especially if your piano kid was struggling with a particular concept. 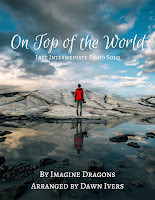 Arranged here as a late intermediate piano solo, this is an upbeat piece that offers practice in syncopated rhythm and octaves in the right hand and is a tried-and-true show stopper at recitals or social gatherings. You can listen to the arrangement in the video below and you can purchase the sheets to try it out yourself here. The sheet music has been published via SMP Press' ArrangeMe program. Learn more about creating your own account to start publishing your arrangements. 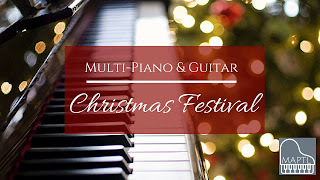 Each year the McPherson Area Piano Teachers' League puts together a Multi-Piano & Guitar Christmas Festival. 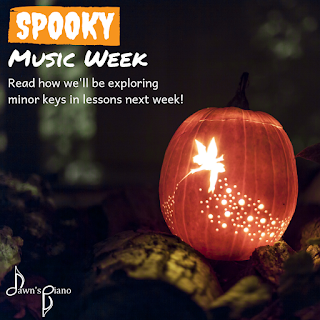 Now, I know it's not Halloween yet, but these kinds of events take planning, and it's actually only 8 lessons away! The way it works is that area music students learn duets in their lessons, and on December 15th, we line up several pianos on-stage at the Wesley Black Fine Arts Auditorium and area piano students will take the stage to perform these duets all together, with guitar performances spread throughout the show as well. All to create a massive Christmas Concert for the community. Students who are beginning staff readers through advanced are invited to participate, and I've already begun having conversations with eligible students in our studio about which pieces they can start practicing. (So no pre-readers yet, but it would be a great idea to attend and get a preview at what you could be doing next year!). Is Your Bench Too Low? 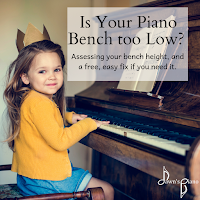 Piano bench height and piano posture can be easily overlooked when starting out lessons, but it can make a huge difference in your piano kid's early technical skills at the instrument. So today's post is asking "Is your piano bench too low?" and giving you some easy tips to fixing it. First off, what are we looking for in assessing bench height? Well, keep in mind that most piano benches are made for an adult musician, so typically you sit down at the piano, the base of the keyboard should roughly be across from your belly, and if your arms are relaxed at your sides your elbows are ever so slightly higher than the tops of the keys. Now, have your child sit at the keyboard, and you may notice that the keyboard is more in line with their chest, and their elbows are below the keys - and if this is the case, the bench is too low to encourage good technic.